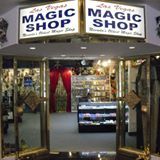 Welcome to Nevada's oldest Magic Shop! At Perry Maynard's Las Vegas Magic Shops you'll find some of the world's greatest magic and novelty items. The LV Magic Shops are located in The Stratosphere Tower Shops@The Stratosphere and Grand Bazaar Shops@Bally’s in Las Vegas, Nevada. Our staff of professional and knowledgeable magicians will amaze and mystify you with incredible demonstrations. Perry Maynard has received the International Magicians Society award for Best Magic Shop in Las Vegas!